Growing up in a tiny shack in the Dominican Republic, Felipe Alou never dreamed he would be the first man to go from his country to play and manage in Major League Baseball — and be the first Dominican to play in the World Series. In his extraordinary autobiography, co-written with sportswriter Peter Kerasotis, Alou tells of the political and personal turmoil he faced as he paved the way for future Dominican ball players in Alou: My Baseball Journey. “This book brings his story alive: his path from an impoverished upbringing to track star to baseball player to become the first major league player from the Dominican Republic,” Ann Killion wrote in the San Francisco Chronicle. “An engrossing book, with baseball as the background and the lessons from a remarkable life going well beyond the game,” said Jorge L. Ortiz in USA Today. “This is the Jackie Robinson story from a Latino point of view,” Baltimore Orioles announcer Gary Thorne said in a video review. Alou played 17 years in the Major Leagues, accumulating more than 2,000 hits and 200 home runs, and then managed another 14 — four with the San Francisco Giants and 10 with the Montreal Expos, where he became the winningest manager in franchise history. Alou became a special friend of Roberto Clemente, roomed with Willie McCovey, Orlando Cepeda, Juan Marichal and Joe Torre, and suffered the tragic death of his firstborn son. In the book, Alou tells of his real dream: to become a doctor. An uncle was funding his university education when an improbable turn of events intervened at the 1955 Pan American Games. At the games as a track and field athlete, Alou was pressed into service on the baseball field to replace a player sent home for disciplinary reasons. A scout noticed Alou and offered him 200 pesos to sign a pro contract. Knowing his father owed the grocer exactly 200 pesos, Alou signed. Battling racism in the United States and political turmoil in his home country, Alou persevered, paving the way for younger brothers Matty and Jesús and scores of other Dominicans, including his son Moisés. Today, the Dominican Republic produces more Major League players than any country outside the United States. At age 82, Felipe Alou still serves as the special assistant to the general manager for the San Francisco Giants. He is an inductee in both the Canadian and the Latino Baseball Hall of Fame and lives with his wife, Lucie, in Boynton Beach, Florida. The book includes a foreword by Pedro Martínez, a Hall of Fame pitcher and fellow Dominican. The book’s co-author, Peter Kerasotis, is an author and journalist who has won 10 Associated Press Sports Editor awards, six Football Writers Association of America awards, and seven Florida Sports Writers Association awards. “Felipe’s 60-plus year career as an All-Star player, successful manager, and team advisor make him one of the most respected figures in baseball today,” said Rob Taylor, senior sports editor at University of Nebraska Press. 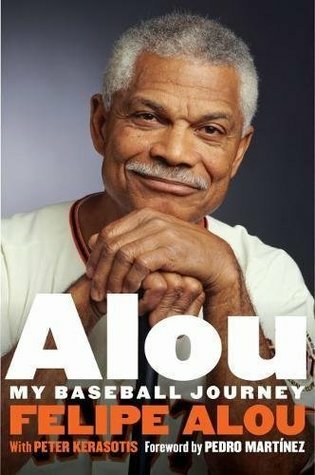 Alou: My Baseball Journey is available on Amazon.